There is no such thing as a perfect wedding. 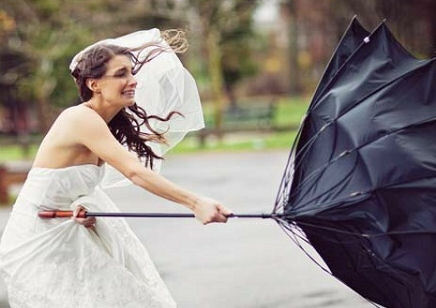 Let’s face it, however much you try to control the planning of the day, the delivery is in the hands of multiple wedding service providers, and your guests are almost always an interesting mix of people, to which is added things no-one can control – the weather, for example. And it is virtually guaranteed that there will be something that someone has forgotten to do or bring, some mistake made, some unexpected complication, some drama, or some comedic accident. In fact, having something go not according to plan is so common that there is an Irish belief that something must go wrong in the wedding because that protects the bigger thing, the marriage. Here are some very good reasons to celebrate any or all of the above. When something goes wrong it serves as a reality check to the perfect day myth that the wedding industry uses to get you buy into the idea that lavish spending is the key to a perfect life. Perfection can’t be bought. No matter how much you pay for your wedding something can (and probably will) deviate from the plan. That’s life. It is when something goes awry that you realise that the people around you are there for you, there is a bond between you, they care about you and about your wedding, so they’ll hop in and help out. A wedding mishap (nothing is a disaster unless you make it one) is a reminder that working together to deal with whatever arises is far more important to a successful marriage than starting it off with a perfect party. When the two of you cope with a wedding mishap with good humour, you will be assured that you’re entering married life knowing that if and when bad stuff happens you will get through it. PS All of the above applies to honeymoon mishaps as well.